HIGH DURABILITY CASES FROM CASES, USA. Pelican Protector Cases are watertight to 30 feet and virtually unbreakable. Inside, pre-scored "PICK-N-PLUCK" foam, Cases-USA custom fabricated or die-cut foam, or padded dividers protect even the most sensitive equipment. 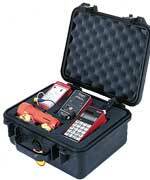 Pelican Protector cases come in 13 stock sizes for all applications ranging from 8-1/2" to 52" wide. O-Ring Seal - Pelican cases feature an exclusive 1/4" neoprene O-Ring to guarantee a perfect seal to a depth of 30 feet. Neither dust nor water can penetrate this barriers, keeping your equipment safe. The O-Ring is easily replaced if damaged. E-Z Purge Valve - All Pelican cases are absolutely airtight. The exclusive built-in O-Ring sealed pressure purge valve allows for quick equalization after changes in altitude or temperature. Extra Thick Wall Construction - Made of virtually unbreakable, lightweight, space-age resin.